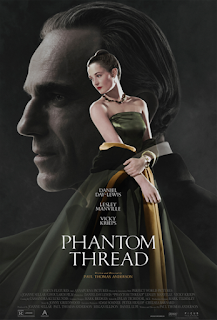 Read Mind on Movies review of Phantom Thread. Set in the glamour of 1950's post-war London, renowned dressmaker Reynolds Woodcock (Daniel Day-Lewis) and his sister Cyril (Lesley Manville) are at the center of British fashion, dressing royalty, movie stars, heiresses, socialites, debutants and dames with the distinct style of The House of Woodcock. A prime example of a really-good-but-not-great film. I adore the setting and the subject matter, both of which are departures for Paul Thomas Anderson. He is showing a very dynamic range as a director and that's interesting to see, despite its obvious flaws. 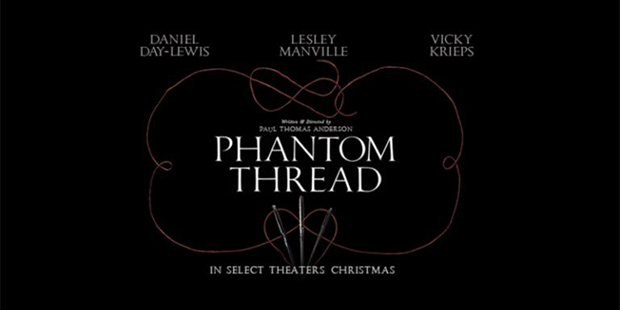 PHANTOM THREAD has a lot going for it. Daniel Day-Lewis is masterful in the last performance of his career, although Vicky Krieps and Lesley Manville are both amazing, outacting DDL is most scenes. Anderson directs the film with pervasive and restrained confidence. The roles feel intimate, almost confidential. The score by Jonny Greenwood (of Radiohead fame) is phenomenal yet a little on the overwhelming side, but it does more than enough to breathe in an insurmountable energy. The costume design is carefully constructed in a way that displays thoughts and feelings. On a technical level, Anderson's film successfully threads the needle to pull off all the difficult tasks it sets itself. However, in spite of all the things I love about PHANTOM THREAD, it faintly misses the mark. At times, the film can feel uninspired. Anderson lets his influences show and the characters can seem ever so slightly out of place. Certain storylines never reach their potential, leaving you wanting more from something that's not there; shallow relationships stuck in their honeymoon phase. Additionally, despite small nuances that differentiate motifs, PHANTOM THREAD can get to a repetitive state, as it is structured to represent a metaphorical tug-of-war between the two main characters. Whatever the case may be for these very subtle issues, PHANTOM THREAD is a charming piece, showcasing excellent performances and quite the spectacular direction from one of the most consistent filmmakers in Hollywood. 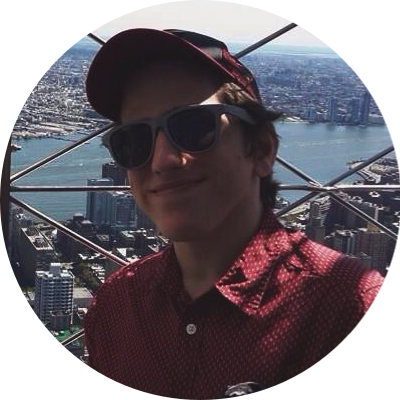 Gerardo (Contributor) is a film student living in Philadelphia. He usually prefers independent and classic films, but he will watch anything in theaters. Click Here to check out Gerardo's Articles.